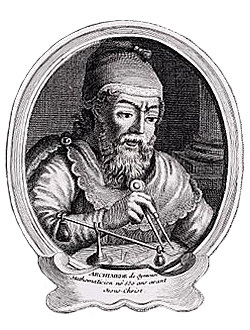 The Law of the Lever Before Archimedes . . .
Why is it that small forces can move great weights by means of a lever, as was said at the beginning of the treatise, seeing that one naturally adds the weight of the lever? For surely the smaller weight is easier to move, and it is smaller without the lever. Is the lever the reason, being equivalent to a beam with a cord attached below, and divided into two equal parts? For the fulcrum acts as the attached cord : for both these remain stationary, and act as a centre. For since under the impulse of the same weight the greater radius from the centre moves the more rapidly, and there are three elements in the lever, the fulcrum,that is the cord or centre, and the two weights, the one which causes the movement, and the one that is moved : now the ratio of the weight moved to the weight moving it is the inverse ratio of the distances from the centre. Now the greater the distance from the fulcrum, the more easily it will move. The reason has been given before that the point further from the centre describes the greater circle, so that by the use of the same force, when the motive force is farther from the lever, it will cause a greater movement. Let AB be the bar, G be the weight, and D the moving force, E the fulcrum ; and let H be the point to which the moving force travels and K the point to which G the weight moved travels. ΤΟ ΚΙΝΟΥΜΕΝΟΝ ΒΑΡΟΣ ΠΡΟΣ ΤΟ ΚΙΝΟΥΝ, ΤΟ ΜΗΚΟΣ ΠΡΟΣ ΤΟ ΜΗΚΟΣ ΑΝΤΙΠΕΠΟΝΘΕΝ. The above passage is from the Mechanica, a work believed to have been written by the Peripatetic School, which is the name given to the followers of Aristotle. It was probably written in the years between the death of Aristotle in 322 BC and the birth of Archimedes c. 287 BC. The “kinetic” argument for the Law of the Lever given in the passage comes close to the idea of energy as the product of force and distance, to the concept of the conservation of energy, and to the principle of virtual velocities. As such, it is a more seminal argument than Archimedes’ “static” one, which does not provide much insight as to why the law is valid.